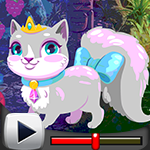 G4K Save Your Cat Game is another point and click room escape game developed by Games 4 King. Welcome back, escapers! Story of this game , Assume that you have a pet cat which is very notorious and playful cat. One day your cat went out of your house and didn’t return back. As your cat is ill, you have to feed your cat with the medicated milk on time. So use your skill to collect the necessary items to feed your cat with medicated milk to save your cat.